Welcome to Oasis, a high-quality button request site run by me, Kate. Customer satisfaction is a priority, and we want you to leave feeling happy and content. If you're not satisfied with your button, tell us, and we'll re-do it until it's perfect. Whether this is your first time requesting, or your 20th, we promise to give you the highest quality button of our ability. Enjoy your stay! This layout looks best in 1200 x 700! I never forgot about the site, but I went on an unannounced hiatus. I started running a new guild Ambition, so I've thoroughly continued to neglect both TDR and Oasis. However, I am going through this page now and cleaning it up. I might even open requests, but I make no guarantees! I'm very rusty anyway. Okay, so last night I didn't have a chance to update, but here I am today! Sorry if you guys were waiting. ;____; There is also a new request style! Now listed at Vitals! *sigh* I didn't fall off the face of the Earth. But, I did get a bit bored with Neo. I've wanted to update the site, but found no motivation. I've also been very busy in real life, so all my free time has gone there. I will try to open requests tomorrow! A bit delayed, but affiliated with one of my absolute all-time favourite sites - Bedazzled!! I am so ashamed in myself. I can't believe I went this long without updating OR without completing my requests. I am so sorry to the 5 of you who have been waiting so very patiently for me. I hope you continue to use the site despite my total lapse in being a diligent site owner. I'm not sure when requests will open again - too addicted to Animal Crossing: New Leaf! I also want to apologize to those who are using buttons that are hosted with my PB account. I'm not sure how or why it happened, but apparently I exceeded my bandwidth, so all the images crashed. They should be back in a few days and I will gladly rehost them for you somewhere else! Custom You design it, from the image to the font face and everything in between! I put your design to life. Kate's Design I make the button from my own creativity to make what a generally better buttons. Great for those who have no idea what they want! Recycle Pick a button that was done previously and no longer in use. You can change the text styling and animation to your own preference, or choose to simply keep the button in its form, but for your site! Quick Pick For those who need a quick button for a wishlist or a pet, the Quick Pick is a cute alternative! You pick the image and text, done on a standard border with unique colouring chosen by Kate. Credit Please leave back credit to this page! In the event the page is down, please link back to trubiekatie. A text link or link back button is fine. Form Follow the form as follows. It makes my life (and yours!) a lot easier. I won't complete forms that aren't complete and/or my form. Request Request only when requests are open! You can request up to 1 button at a time and this can be for guilds, petpages (and applications), sites (not button makers) and any other good reason you can think of, so long as its appropriate and on Neo. I don't make buttons for offsite pages. I will take requests for unopened sites as well! Content I will not take a request for a site with stolen or inappropriate content. I follow the rules set out by TNT, so you should too. If you've read the rules, put 'Lochness' in the request form under 'Anything else?'. Images If you are providing the image, it must be Neo appropriate and you must post it somewhere I can find it. The higher quality the image, the better the button. Satisfaction Oasis' promise is to leave you happy. If you don't like the finished product, I will change it for your liking. Use If you decide to not use your Oasis button, please let me know. I have had 36% of my buttons go unused, which is a waste of everyone's time. I would love to be able reuse it for someone else who will use it! Sometimes, you just know what you want your button to be. You have the entire design in your head, but you need someone to make it happen! That's where I come in! I can help make your design come to life, you just need to give me the details. For people without this design, a completely custom design allows you to see all your possibilities and begin to create your own. For your custom button, you can choose: font face, animation(s), border and image! Anything you are unsure about, you can leave up to me and I'll fill in the gaps for you. 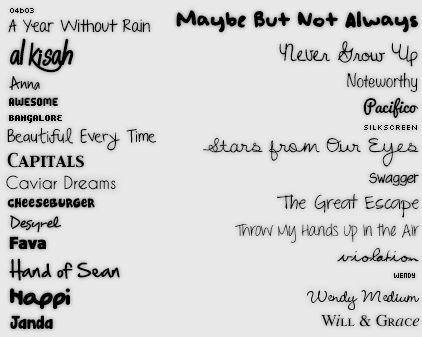 Here is a selection of some of my more commonly used fonts. NOTE: This is not a comprehensive list of fonts! You can browse daFont and I will be happy to use one of those (if I don't already have it!). You can also get ideas from Bedazzled and A Button Collection. The life of the button! When choosing a custom, please select only one animation. If you'd like more than one, please suggest an alternative animation that I could use in the event both don't work. Those marked with a ** are for pixel fonts only. NOTE: You are more than welcome to combine pixel and mixed font animations together, but please don't go overboard! If I think you've done too much, I'll let you know. Some are Oasis creations, some are the genius works of other amazing button makers. Those not an Oasis creation are linked to their respective owners and all credit belongs to them. Some borders make for better buttons with specific fonts! Something like border #15, for example, works well for pixel fonts because of it's small button size. If you wish to use an Oasis design, go right ahead, just credit the idea. By choosing Kate's Design, you're allowing me to design a button to my own style. This can normally yield better buttons, since I can use my own creativity to see what works, instead of forcing something together. NOTE: I will not use a previously used image for these kind of buttons. If you'd like to see what I've used, check out the Oasis button portfolio. If you see that I've used the image, simply fill out a Custom request instead (if requests are open). The Recycle program is a unique initiative. In an attempt to re-use my bases, people can choose to either take the base or the entire concept of the button, with the text and animation changed to your liking. This page will be updated as people take the buttons and new ones added as people stop using the buttons. When you request, feel free to add your own elements of the custom button in the anything else? portion of the form. The number corresponds to the image below it. With a Quick Pick button request, you can get a simple button for your specialty wishlist or pet needs! You choose the image and text, which is done on a standard border. I will colour and animate each button based on the request. All I need is the name of the item OR the kind of pet and I will do the rest! For example, a request could be for a UC Darigan Scorchio (Pet Name) with the text Nahara - Not UFT or UFA (Text). If choosing an item based image, it must be a Neopets item and it must be 70 x 70. Providing the link is a bonus for me! Behold Kate's Oasis, my own personal paradise of buttons! These were not made by me, but instead, are a collection of what I think are my favourite buttons ever. They are simplistic and perfect. When I get in a button making drought, I go to these for inspiration! The buttons here are for your own use! Whether you need a simple placeholder for something, or you want to try getting into buttons, you can use all of the resources. The cropped buttons are images shaped to be buttons with no styling! This leaves animation, image design, text and border up to you! This is great for practicing your own abilities. Please leave credit when you use them! Be specific! These are all the placeholders that I have made. You are free to use them for your own pages, just please leave the credit back to Oasis or my main account (trubiekatie). If you have any suggestions or requests, feel free to mail me your ideas and I'll do the best I can! Obelisk War/Altador Cup Support your faction in these on-going skirmishes or your team in the annual Altador Cup! Two different styles for the Obelisk War - text and image based for your choosing. Lend Me Reserved for the more difficult item lends, show your hope to obtain these avatars with these buttons. If adjusting the link to a special lend me page, please add credit to your userlookup! Needed Are you a collector? These buttons are sure to help link people to your correct wishlist pages. When adjusting the button code, please leave credit to Oasis on your userlookup! My name is Kate and I run Oasis! My main account is trubiekatie, but my active sides are turbulous, redeemyourself and inapposite. I'm currently studying Finance in my third year of university in Canada and loving every moment of it. If you want to learn even more (yes, more...), feel free to read my portfolio! I'm hopelessly obsessed with Draiks (I own 12 of them!) and I love drawing and creating characters for them. On Neo, I collect avatars and trophies, resell a bit and write poetry. I also run The Draik Realm. I really wanted to create a site to help other people get Draiks, since it can be a hard task to raise the NP required to buy an egg and/or morph. I'm in a wonderful guild called Ambition, which is a goal-oriented school-themed guild. It's been a great success so far! After a long and tiring start, Oasis came to be on December 29, 2012. I did an entirely different layout and set-up when I initially began planning, but hated every bit. 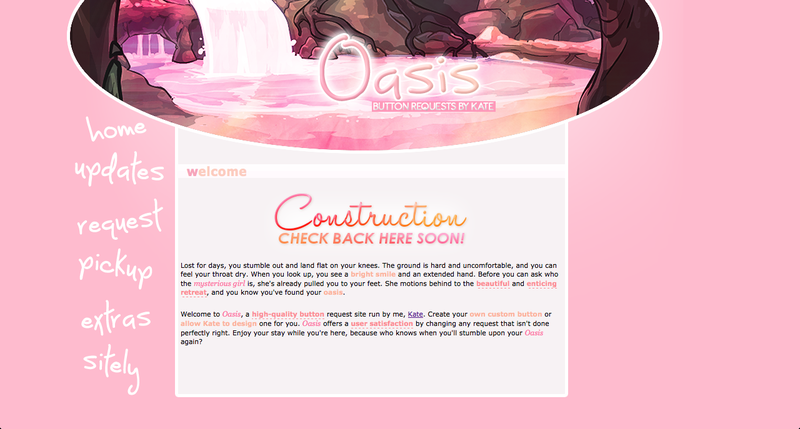 The site is named Oasis because I wanted button making to be synonymous with relaxation and enjoyment. I make buttons because I like them and I hope my users agree. I began making buttons in the winter of 2012. I can't say they were good (take a look at the button portfolio and scroll to the bottom! 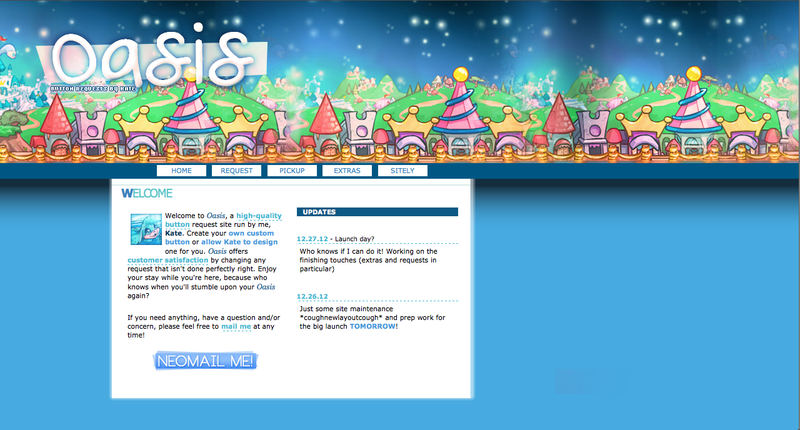 ), but I improved enough that I thought running a button making site would be fun. I'm also obsessed with Open Eyes, Euphoric, Bedazzled and Saranghae, which I use as my inspirations. Unsure about what to expect? Why not read these testimonials from users who have previously requested from me? It can give you insight about how long to wait, the quality and overall experience. If you want to give your own insight about a recently requested button, feel free to send me a mail! The button quality is amazing and the animation used was smooth! I was really impressed with how my buttons turned out! Kate's buttons never cease to amaze me. She commits herself fully to ensure that her visitors are, not only completely satisfied with their requests, but also stunned at the pure quality and true beauty that each of her buttons possess. Kate is my go-to whenever I need a new button, and each and every time she does, my reaction is the same. I absolutely recommend her to fulfill your "link back" needs. When I clicked upon the pickup page, there was a shimmering button sitting there awaiting me to pick it up. It was a stunning button. I love Kate's buttons and I recommended Oasis to anybody! Button requests not filling your needs? Maybe Oasis's high quality icon requests can! Whether you need something for a competition, guild or some other reason, I would be happy to help you! Request Request only when requests are open! You can request up to 2 icons at a time and this can be for guilds, petpages (and applications), sites (not icon makers) and any other good reason you can think of, so long as its appropriate and on Neo. I don't make icons for offsite pages. I will take requests for unopened sites as well! Images If you are providing the image, please be the link Neo appropriate or post it somewhere I can find it. The higher quality the image, the better the button. Roo is an amazingly wonderful adoptables request site, run by none other than my dear friend Fish! If you're looking for adorable and high-quality adoptables (premade or request), she is your go to girl. These little ice cream cuties are heavenly and I urge you to check her amazing site out!